To celebrate their momentous victory with their leading official partner, the Islamabad United team champions of PSL 3 brought the winning PSL trophy to PTCL Headquarters. 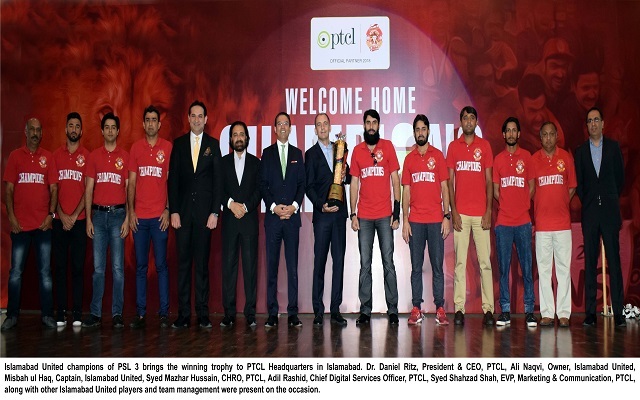 Dr. Daniel Ritz, President and CEO, PTCL, Ali Naqvi, Owner of Islamabad United, along with other PTCL and Islamabad United Management members were present on the occasion. The Islamabad United management and players interacted with PTCL employees, who were very happy to see the Islamabad United stars amidst them. PTCL management also announced a cash reward for the Islamabad United team players for their remarkable performance in the tournament. PTCL and Islamabad United has proven to be a winning combination. PTCL has always played its due role as a national company, supporting national sports and will continue doing so in the future as well.